We Start the Countdown | Sprezzatura, Y'all! 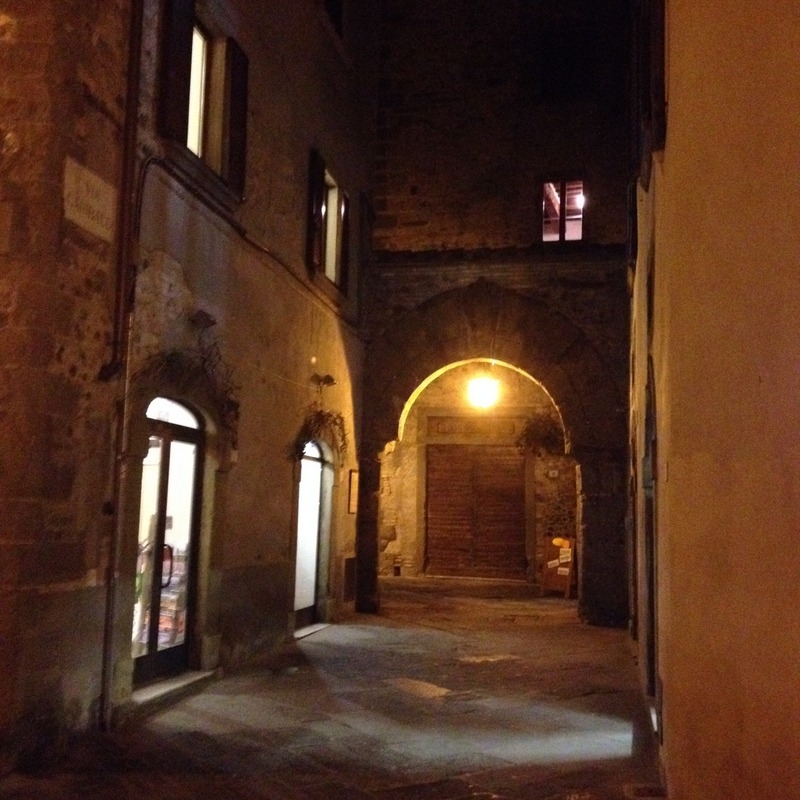 Eight more nights in Italy, six more nights in Anghiari. We alternate between panic that we have to pack and move all the stuff we’ve accumulated back to Georgia, and trying to savor each moment. We feel like if we’re not making the most of every minute, we’re wasting precious time. We have a lot of things planned over the next several days and we really don’t have much free time. So that causes more panic. Tuesday was absolutely gorgeous. It was about 55 degrees and sunny and clear. We went for a long walk all over town. We stopped at vista points and just looked, trying to memorize every rooftop and winding street. We looked at the valley and hoped that the images stay in our mind, so that when we need to take a little mental vacation, we can summon them up. We would stop and look at each other and sigh, knowing that there’s really nothing we can say at this point. Just enjoy what time is left. The funny thing is, the amount of time we have left is like a regular vacation for most Americans. A little over a week, not quite two. On our walk we ran into Anna, one of our friends who just had a baby on New Year’s Eve. She was out strolling her baby, Sophie, and we went to her house for a little visit. 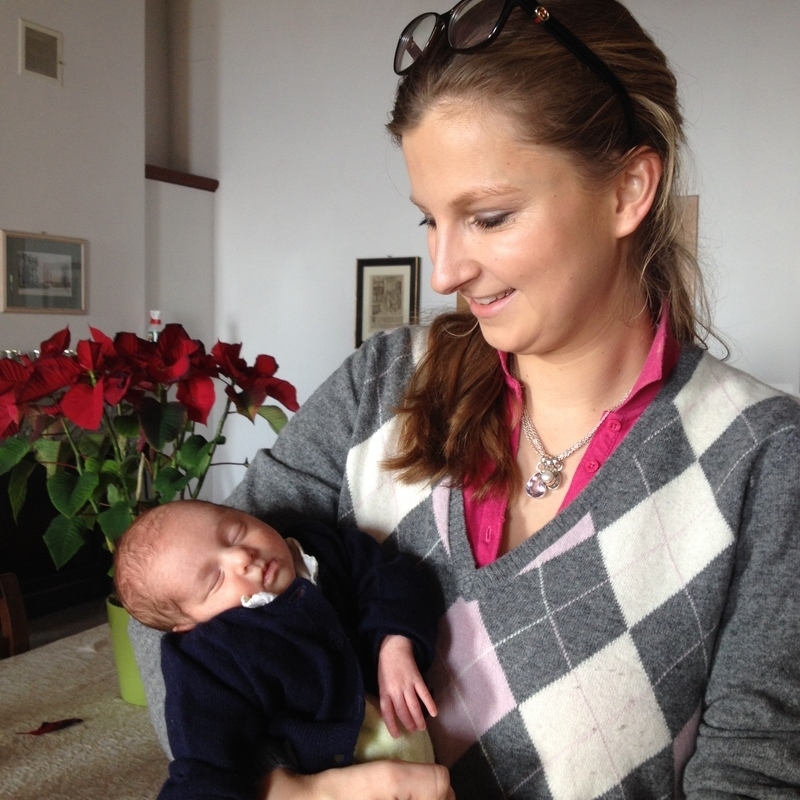 Sophie was born about a month early and was teeny tiny at birth. She’s gained some weight and is growing, but still small. She’s a precious little baby and I’m so glad we got to meet her and welcome her into the world. 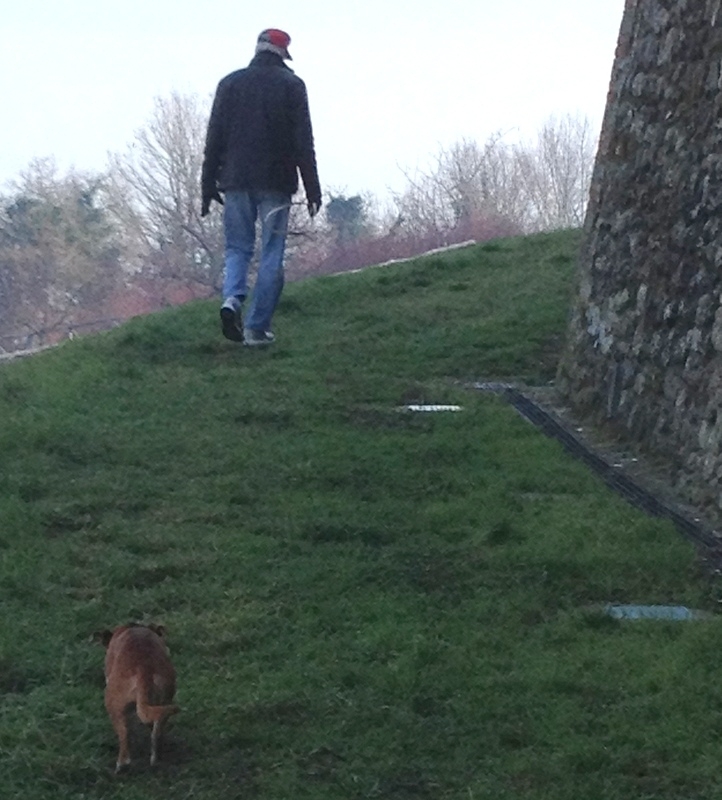 We also took a long walk around the old city walls. We let Millie off her leash and let her run. One of the drawbacks to living in the village is that Millie doesn’t have a yard to run around in so she’s always on her leash. She doesn’t mind, but she does like to run like a banshee sometimes. She got to do just that and she had a great time. One of the things we have to factor into our remaining time is food. We don’t want to miss a good meal, so we plan out our days around lunch or dinner. Yesterday we decided to go out to dinner at one of the restaurants in town so we had a salad for lunch at home. We took another long walk in the afternoon, a little gelato while we were out (hey, only eight more days), then we got ready for dinner and walked down to the piazza. The restaurant we wanted to go to was closed for vacation until Thursday, so we decided to drive to Sansepolcro for dinner. Before we did, we took another tour through Anghiari and stopped into the Caffe della Sportivo (we call it the sports bar, even though it’ s not a sports bar at all). It’s owned by Rossono, who’s become a special friend to us and he was there. I had a Negroni, because I’ve never had one and felt like I should before I leave the country. It was good – I think it would really be good in the summer – nice and refreshing. Rossono had a book of photographs of this area taken during WWII. Several of Anghiari, including one very haunting one of a lifeless soldier lying at the top of the long street that slices through the city. Several other customers joined us in looking through the book. One, Carlo, a painter who we’d met before, showed us a picture of his mother cutting the hair of a British soldier in the middle of the street. Another, Giovanni, explained in detail some of the photos – all in Italian, so we got about every fourth word. We did learn that Giovanni is the cousin of one of our neighbors, Maria. Small village. After our cocktail hour, we drove over to Sansepolcro. We’ve only been at night once before and that was during a festival, so there were things set up all over the streets. It’s really a beautiful town with lots of shops and many restaurants. We strolled through town and made our way to a restaurant we went to once when Myra was here. We enjoyed it and thought we’d try it again. Closed on Tuesdays. So we went to a place we’d been to a couple of times back in the summer. Then, we ate outside. Last night we ate in the dining room, which is a gorgeous old room (they say it’s two hundred years old). It’s called Ristorante Fiorentina and has been in the same family for over 50 years. It’s a slow food restaurant (you know how I feel about those). We had a delightful meal. I had my new favorite salad of fennel, oranges, and pomegranate seeds. The other place I had it was in Sansepolcro, too. It’s a wonder combination and tastes so fresh and flavorful. Then I had pappardelle with cinghiale ragu. Steve had raviolini in brodo and a pork fillet. Then a great dessert cart. We picked something and she said yes, and what else? We said that’s enough, and she said no, you must get something else. So we did. Three generous samples of homemade desserts that were divine. The entire plate cost four euro. We drove home happy and full and tired. Lots of walking and energy spent trying not to think about leaving. Instead of thinking about that, we decided to think about tomorrow and what we would do with a brand new day. That was much more fun and much more relaxing. Ya’ll will never be the same!I really can’t imagine what this time has meant to both of you! So beautifully described, Cathy! Really don’t know how you are leaving that enchanting lifestyle!!! Your salad is so pretty.